One of the greatest hazards to flight is aircraft icing. The instrument pilot must be aware of the conditions conducive to aircraft icing. These conditions include the types of icing, the effects of icing on aircraft control and performance, effects of icing on aircraft systems, and the use and limitations of aircraft deice and anti-ice equipment. Coping with the hazards of icing begins with preflight planning to determine where icing may occur during a flight and ensuring the aircraft is free of ice and frost prior to takeoff. This attention to detail extends to managing deice and anti-ice systems properly during the flight, because weather conditions may change rapidly, and the pilot must be able to recognize when a change of flight plan is required. Structural icing refers to the accumulation of ice on the exterior of the aircraft. Ice forms on aircraft structures and surfaces when super-cooled droplets impinge on them and freeze. Small and/or narrow objects are the best collectors of droplets and ice up most rapidly. This is why a small protuberance within sight of the pilot can be used as an “ice evidence probe.” It is generally one of the first parts of the airplane on which an appreciable amount of ice forms. An aircraft’s tailplane is a better collector than its wings, because the tailplane presents a thinner surface to the airstream. Ice in the induction system can reduce the amount of air available for combustion. The most common example of reciprocating engine induction icing is carburetor ice. Most pilots are familiar with this phenomenon, which occurs when moist air passes through a carburetor venturi and is cooled. As a result of this process, ice may form on the venturi walls and throttle plate, restricting airflow to the engine. This may occur at temperatures between 20 °F (–7 °C) and 70 °F (21 °C). The problem is remedied by applying carburetor heat, which uses the engine’s own exhaust as a heat source to melt the ice or prevent its formation. On the other hand, fuel-injected aircraft engines usually are less vulnerable to icing but still can be affected if the engine’s air source becomes blocked with ice. Manufacturers provide an alternate air source that may be selected in case the normal system malfunctions. In turbojet aircraft, air that is drawn into the engines creates an area of reduced pressure at the inlet, which lowers the temperature below that of the surrounding air. In marginal icing conditions (i.e., conditions where icing is possible), this reduction in temperature may be sufficient to cause ice to form on the engine inlet, disrupting the airflow into the engine. Another hazard occurs when ice breaks off and is ingested into a running engine, which can cause damage to fan blades, engine compressor stall, or combustor flameout. When anti-icing systems are used, runback water also can refreeze on unprotected surfaces of the inlet and, if excessive, reduce airflow into the engine or distort the airflow pattern in such a manner as to cause compressor or fan blades to vibrate, possibly damaging the engine. Another problem in turbine engines is the icing of engine probes used to set power levels (for example, engine inlet temperature or engine pressure ratio (EPR) probes), which can lead to erroneous readings of engine instrumentation operational difficulties or total power loss. The type of ice that forms can be classified as clear, rime, or mixed, based on the structure and appearance of the ice. The type of ice that forms varies depending on the atmospheric and flight conditions in which it forms. Significant structural icing on an aircraft can cause serious aircraft control and performance problems. A glossy, transparent ice formed by the relatively slow freezing of super cooled water is referred to as clear ice. [Figure 4-17] The terms “clear” and “glaze” have been used for essentially the same type of ice accretion. This type of ice is denser, harder, and sometimes more transparent than rime ice. With larger accretions, clear ice may form “horns.” [Figure 4-18] Temperatures close to the freezing point, large amounts of liquid water, high aircraft velocities, and large droplets are conducive to the formation of clear ice. Figure 4-18. Clear ice buildup with horns. A rough, milky, opaque ice formed by the instantaneous or very rapid freezing of super cooled droplets as they strike the aircraft is known as rime ice. [Figure 4-19] The rapid freezing results in the formation of air pockets in the ice, giving it an opaque appearance and making it porous and brittle. For larger accretions, rime ice may form a streamlined extension of the wing. Low temperatures, lesser amounts of liquid water, low velocities, and small droplets are conducive to the formation of rime ice. Mixed ice is a combination of clear and rime ice formed on the same surface. It is the shape and roughness of the ice that is most important from an aerodynamic point of view. 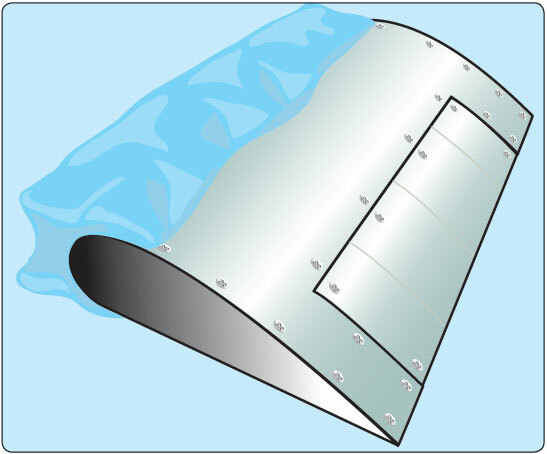 The most hazardous aspect of structural icing is its aerodynamic effects. 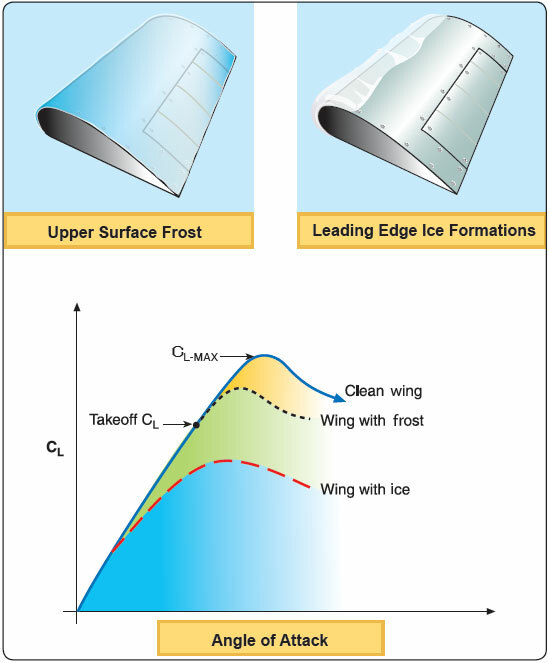 [Figure 4-20] Ice alters the shape of an airfoil, reducing the maximum coefficient of lift and AOA at which the aircraft stalls. Note that at very low AOAs, there may be little or no effect of the ice on the coefficient of lift. Therefore, when cruising at a low AOA, ice on the wing may have little effect on the lift. However, note that the ice significantly reduces the CL-MAX , and the AOA at which it occurs (the stall angle) is much lower. Thus, when slowing down and increasing the AOA for approach, the pilot may find that ice on the wing, which had little effect on lift in cruise now, causes stall to occur at a lower AOA and higher speed. Even a thin layer of ice at the leading edge of a wing, especially if it is rough, can have a significant effect in increasing stall speed. For large ice shapes, especially those with horns, the lift may also be reduced at a lower AOA. 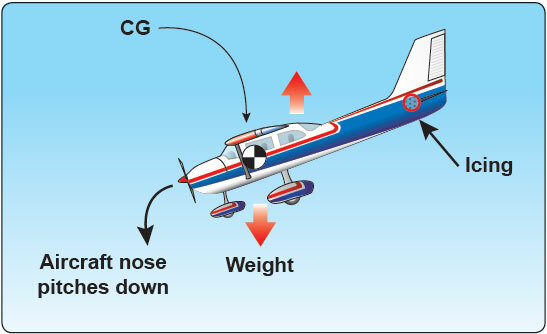 The accumulation of ice affects the coefficient of drag of the airfoil. [Figure 4-20] Note that the effect is significant even at very small AOAs. Figure 4-20. Aerodynamic effects of icing. A significant reduction in CL-MAX and a reduction in the AOA where stall occurs can result from a relatively small ice accretion. A reduction of CL-MAX by 30 percent is not unusual, and a large horn ice accretion can result in reductions of 40 percent to 50 percent. Drag tends to increase steadily as ice accretes. An airfoil drag increase of 100 percent is not unusual, and for large horn ice accretions, the increase can be 200 percent or even higher. 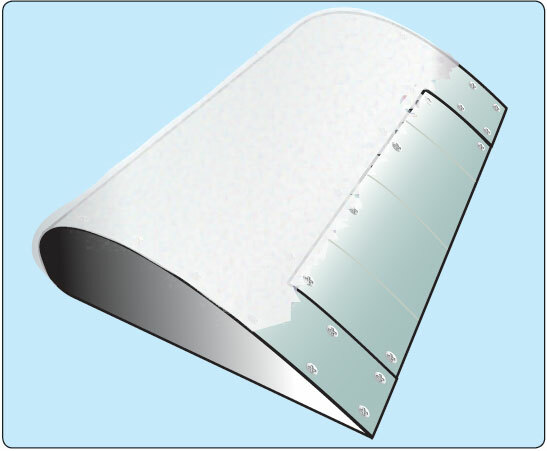 Ice on an airfoil can have other effects not depicted in these curves. Even before airfoil stall, there can be changes in the pressure over the airfoil that may affect a control surface at the trailing edge. Furthermore, on takeoff, approach, and landing, the wings of many aircraft are multi-element airfoils with three or more elements. Ice may affect the different elements in different ways. Ice may also affect the way in which the air streams interact over the elements. Ice can partially block or limit control surfaces, which limits or makes control movements ineffective. Also, if the extra weight caused by ice accumulation is too great, the aircraft may not be able to become airborne and, if in flight, the aircraft may not be able to maintain altitude. Therefore any accumulation of ice or frost should be removed before attempting flight. Figure 4-21. Effect of ice and frost on lift. Another hazard of structural icing is the possible uncommanded and uncontrolled roll phenomenon, referred to as roll upset, associated with severe inflight icing. Pilots flying aircraft certificated for flight in known icing conditions should be aware that severe icing is a condition outside of the aircraft’s certification icing envelope. 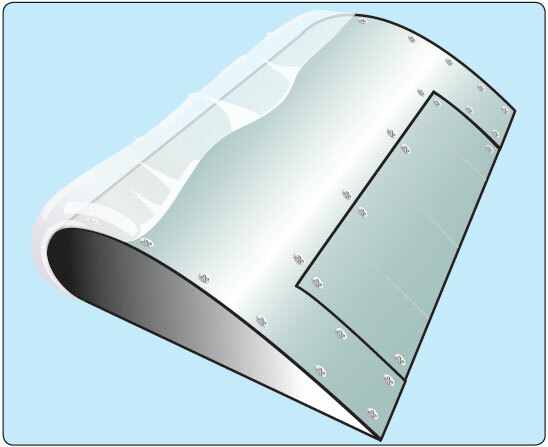 Roll upset may be caused by airflow separation (aerodynamic stall), which induces selfdeflection of the ailerons and loss of or degraded roll handling characteristics [Figure 4-21]. These phenomena can result from severe icing conditions without the usual symptoms of ice accumulation or a perceived aerodynamic stall. Figure 4-22. Downward force on the tailplane. Figure 4-23. Ice on the tailplane. Since the tailplane is ordinarily thinner than the wing, it is a more efficient collector of ice. On most aircraft the tailplane is not visible to the pilot, who therefore cannot observe how well it has been cleared of ice by any deicing system. 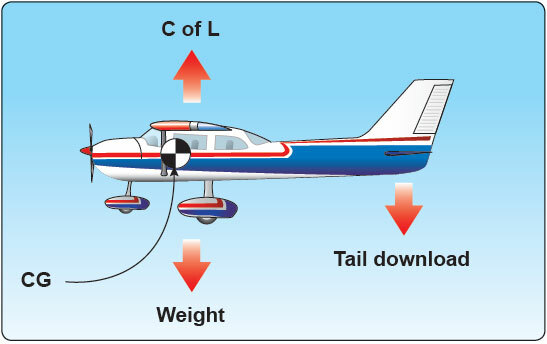 Thus, it is important that the pilot be alert to the possibility of tailplane stall, particularly on approach and landing.